I need to get this out there. For 25 years I have had an on-again, off-again relationship with a hot little Italian. You’ve probably seen her; hour-glass figure, angular good looks. We have had an international fling, fun at times, disappointing at times, but we keep meeting back up at different stages in our lives. 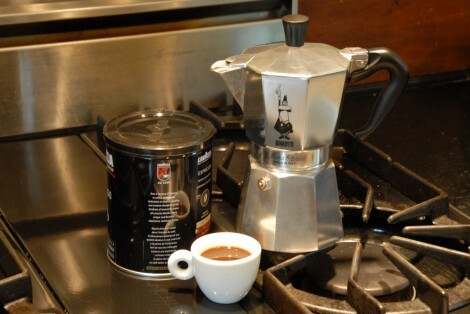 Before anyone feels the need to email my wife, I’m speaking (of course) about the Bialetti Moka Express, the iconic Italian stove-top coffee maker. I first met Bialetti when I was in college, when I bought one for a friend as a thank you gift for letting me crash at his house for a while. We made ‘espresso’, and read ‘newspapers’, and discussed the ‘important events of the day’ (events far more important than those since, or before for that matter) around a little kitchen table in Austin, Texas. I understand now that the Moka Express, despite that promising last name, doesn’t make espresso – or even expresso. But at the time it was espresso, and so very Italian; more Italian than we knew. Eventually I would become disenchanted with Bialetti. I would start going out for coffee, to cafes and coffee shops where they had big Faema machines and tables full of language professors, and ex-pats, and underground cartoonists all smoking French cigarettes, and I would have real espresso. Suddenly that fake espresso of the Moka Express didn’t seem so significant or worldly. It seemed a bit of a lie, a pretense, perhaps even an affectation. Despite our growing distance, Bialetti did make the trip to Wales with me, but she was soon bored. I couldn’t buy real coffee, particularly not anything resembling an Italian roast, in my little town and this was years before something like Amazon would arise to save us from the constraints of our geography. I think she may have stayed in a box the whole time, although the weather was so bad and the winters so dark that it would have been hard to tell the difference. And then, like a cad, I left Bialetti behind when I journeyed overland to her home country. When I got to Naples, everyone knew Bialetti (in actual fact, 90% of Italians homes have a Moka Express). Here, in the home of espresso, people loved Bialetti. So, it wasn’t espresso. Who cares? Chi c’e’, c’e’.. chi non c’e’, non c’e’. The Bialetti was, and still is, the way people made coffee at home. Big shiny espresso machines were for cafes and bars. The Bialetti was a homebody, cranking out pot after pot of ‘moka-pot coffee’. Nobody I knew had a coffee grinder. No one was seeking out single origin, estate grown, locally roasted coffee beans. Kimbo was a local favorite, as was Lavazza, bought pre-ground in plastic vacuum-pack bricks. Sometimes heated (not frothed) milk was added, mainly at breakfast, or perhaps for the infirm. Often the first drops of coffee to sputter forth from the Bialetti were ‘creamed’ with the sugar for the whole pot, to give a sort of pseudo-creama to the coffee. But always, at people’s homes, the little Bialetti was happy to entertain. I began to understand that my earlier disappointments with Bialetti were about me and my expectations, not about her. The Bialetti never claimed to make espresso. That last name of Moka Express wasn’t intended to deceive, it was just a little linguistic foible, charming, really, in retrospect. For two years I made coffee with the Bialetti; at home, at friends houses, even out on the Mediterranean, sitting in the sun, happily brewing away with the aid of an old Coleman stove balanced on the stern of a boat. Still, I left Italy not with the faithful Bialetti, but rather with a medium sized, lever action Pavoni carefully packed away with a Capodimonte espresso cup set, and the rest of my belongings. The Pavoni was a serious espresso maker, after all, with a pressure gauge and a portafilter. Making espresso with the Pavoni was a sort of art, much more than a science. Grind the coffee too finely, and the lever wouldn’t pull down and you would have to let the whole thing cool down for an hour before you could start over. Grind the coffee too coarse and you would get a bitter, thin cup of coffee. Because of the hassle and danger of a bound up machine, I made many bitter, thin cups of espresso. I progressed on past the Pavoni, although it still sits in my basement, awaiting the day that I send it to Thomas E. Cara, LTD in San Francisco for a complete overhaul. I moved first to a Francis!Francis! X1, because it was modern and could use ‘pods’ of some sort and had a pump. Those little pods, by the way, are a terrible idea. Stale, pre-ground coffee wrapped in thick paper. It’s like drinking left over coffee through a newspaper. I ditched the pod adapter, and things were a little better. Finally I moved on to my ‘forever’ machine, a Giotto Rocket, a big chromed chopper of a machine with gauges and steam wands and water spouts galore. Most importantly, the Rocket features a Faema e61 style brewing head, a full kilogram of chromed metal that heats up and stays hot. So, as I pursued espresso perfection at great time and expense, spared nary a thought for Bialetti. Sure, I had some fond memories, but those days were past. I had fancier, more exciting coffee machines to occupy me. That is, until, a couple of years ago, when I found myself in a beach house in Vieques, Puerto Rico. I spent a couple of mornings desperately trying to coax a drinkable cup of coffee out of a German automatic drip pot of some sort – a Braun or a Krupps – with no luck. Then, I found her, the Bialetti. She was stuffed into the back of a cabinet, behind some mismatched stainless pots and lids, forgotten and neglected. If you want fine German machinery, get a sports car. If you want great coffee, go Italian. A quick trip to the market for some Puerto Rican pre-ground coffee, a quick wash, and Café con leche began to flow forth from the kitchen. I was relieved to have a decent, make that excellent, cup of coffee – as were our guests. The Bialetti had crossed the ocean once again, and found her place in the sun. I really hope she’s happy there. I plan to visit again soon, and we’ll see how it goes. Thanks so much for doing this Bialetti pot video. So very helpful to a new owner. Yours is the most enjoyable and informative such video out there. Clearly presented. Nice job. Hi Peter. I stumbled upon your Web site after searching for information on the Bialetti Moka Express. I was really impressed by your video demonstration and started watching several of your other videos and reading the articles on your Web site. It’s all good stuff. I’m relatively new to the Bialetti, but was impressed enough by it that I have abandoned the pour-over brewing method that I have used for the past several years. After watching one of your coffee recipe videos, I became interested in your Rocket espresso machine and have been doing research for the idea of owning something like that. Some aspects of it intrigue me, but some other sources of information make me think the expense and effort isn’t worth it. If you’re open to ideas for future videos/articles, I’d really like to hear your take on the Rocket, or espresso machines in general. For example, why did you choose the Rocket? Is it your primary source of caffeine? Was it worth it? Do you feel you’ve mastered its use, and if so, how long did it take? Thanks for your comment, and the idea for a Giotto Rocket video. Until I get around to that, I can give you some quick answers right here. I chose the Rocket because it has a Faema e61 brewing group. That is about 1.2 kg of brass, with water channels that heat the brew head and provide great temperature stability. The Rocket is one of several machines that has that group (or a similar setup), and the Rocket got great reviews for durability, maintenance, etc. Plus, I thought it looked really cool. I have had a lot of espresso machine experience prior to the Rocket, so it’s hard to say how long it took me. It’s much more forgiving than my manual pump La Pavoni, and much more consistent than my FrancisFrancis X2. I wouldn’t say I’ve mastered it, I pull bad shots just like everyone else. But I can usually pull a pretty good one on the second try. One of the secrets of getting a great shot in a cafe is that they pull lots of shots – they are adjusting the grind all day long. They dump a couple shots in the morning, getting everything dialed in. It’s not that baristas never pull a sour shot, they just don’t serve it (hopefully). There are many, many books on this, but really it’s about eliminating variables. Use a scale for dosing the grounds, until you get a good eye for it. Use a consistent tamp – use the scale if you need to train the feel. Then the only real variable left to mess with is grind. Keep everything else the same, and dial it in. There are people who are far more knowledgable than I am about this, and they will temperature surf the group depending on bean origin, and come up with elaborate tamping regimes – and that’s great. I’m happy to pull a nice thick smooth shot that I enjoy. Is it worth it? Hard question. Between the cost of the machine, the cost of coffee, and the cost of power I would probably have to pull a few thousand shots to hit break even, versus going to a coffee shop. So, from a dollars and cents standpoint not at all. However, I can serve up a half-dozen espressos after a diner or make myself a ‘regulation’ cappuccino in the morning with out leaving the house. I have friends who are very happy with their Nespresso machines. I wanted a bit of a challenge, something to tinker with, a boiler strong enough to steam milk to micro foam, and a brew group as capable as a small commercial machine. It was the right choice for me. (I also got a really sweet deal re-importing it from a Canadian seller.) It would not be the right choice for many people. Some of the super-automatics have gotten pretty good (the big Jura’s), and if you want a pretty good, trouble free cup in the morning that’s a good solution in a similar price range. If you want something less expensive, less bulky, and with less of a heat up time there are ton’s of choices – but there will be some limitations as well. The smaller machines can’t provide the temperature stability or the steam capacity. In terms of capsule or pod based machines, I wasn’t happy at all with the ESE pods but I have had good coffee from the Lavazza capsule machines in Italy – not sure if they are available in the U.S. And, finally Nespresso seems to be taking over the market for machines below about $500. Once again, thanks for commenting and I’ll certainly put a Rocket video on the list. Hi Peter, I found your video while looking for a new Bialetti pot–lost my original somewhere while moving back and forth between Chicago, Germany, Italy. Your video took me back to my nostalgic college days but also gave me some good tips and tricks …I tried every ground possible until I found one that wouldnt cause pressure problems. My real question though is about your gorgeous oven. I love the look and practicality of materials: stainless vent, backsplash and hood. What type of range and hood is it, if you dont mind sharing? And are you happy with it? Many thanks for sharing your knowledge and experience. Sorry for the late response – the range is a Viking. It’s a 30′, gas only model. I believe that it was called the Professional when it came out, which was about 15 years ago. The newer Vikings are very similar, except that even the 4 burner ranges have the cast iron grate across the entire surface, making sliding pots around easier. As for liking it – it’s ok. The plus side is I’ve tweaked the gas/air mix and supply, so I have 4 burners with huge output. I have to replace oven ignitors about avery 18 months – but I’ve found i can use the generic versions which are only about $10, and the job only takes about 20 minutes. My main issue is the insulation, or lack thereof. The oven door gets very hot. Not stick to your skin hot, but uncomfortable. The range hood is a Broan RangeMaster. I think that Broan has been bought, but they still make a very similar hood. I like it – good lighting, heat lamps that actually work, and can deal which however much smoke I’m making in the kitchen. It can be a bit loud. If I were starting from scratch I would remote mount the motor, and see if I could use something like the Panasonic ventilation blowers – those things are nearly silent. I use a Bialetti moka pot every morning. It’s a six-cupper, and I drink the entire thing, mixed with full fat coconut milk – makes one big mug, and I’m set for the day. Thanks so much for your video! I have one question, though – you removed your pot from the heat far earlier than I do mine. I watch mine until the last drops sputter from the tube, then immediately pour it into my mug. Am I overcooking it? I was afraid that excess water would be left in the reservoir otherwise. Sorry for the late reply. I tend to pull the pot off the heat before the coffee in the top chamber begins to boil, as I think that makes it particularly bitter. I usually have a tablespoon or less of water in the bottom reservoir, depending on how far down the siphon tube reaches. I don’t find that to be a problem. It’s going to depend a bit on the pot.